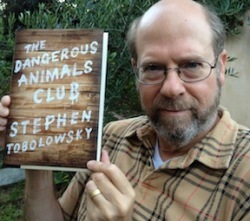 If you’re like me, and you’re excited about the Dangerous Animals Club, then by all means, run out to your local bookstore and buy it today (or get it on your Kindle, Nook, etc.). If you’d perhaps like to win your very own copy of the book, you can go to www.bumpershine.com/dangerous and try your luck. No purchase necessary. Contest ends on Oct 2 at 11:59 59 PM ET, 1 entry per person. Stephen wrote a good post about the making of the book over here. View a bunch of promotional videos for The Dangerous Animals Club after the jump. PS Despite my best efforts, we weren’t able to bring the live Tobolowsky Files back to NYC for the book launch. Don’t be too discouraged though, we’re still looking to the not so distant future for a return date. Stay tuned!